An unorganized and misaligned ITSM strategy can drag down processes and tools, resulting in an increasing volume of service delivery issues and creating headaches for external customers and employees alike. One company sought a solution that would resolve these issues, while giving their users increased availability, speed, and transparency. Not only did they find an ITSM solution that delivered these values, but also ended up saving them more than $400,000 within the first six months. 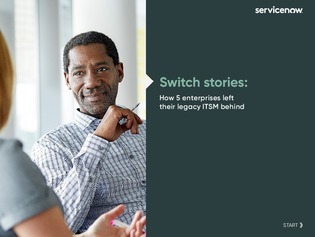 Learn more about this company and four other leading brands and how they overcame challenges with their legacy ITSM in order to keep digital transformation the focal point of their corporate strategies.